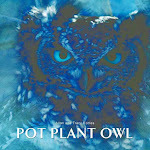 Pot Plant Owl stayed out of the nest for a record 40 minutes last night. Amazing to think that she can be away from the nest and eggs all that time, and the eggs don't get cold. Our Spring temperatures are good with lovely sunny days and warm evenings, so I guess that helps. Pappa is scarce at night. We've noticed over the past few years that during this period (just before the eggs hatch), Pappa travels further away from the nest to hunt. We suspect that is so that the food supply close to the nest will not be depleted when the chicks arrive, and food is required in vast quantities.